Soup season has us in its wintry grip, and now is the time to give in to its demands. “Make more soup,” the wind insists as the sleet pelts down from the hoary sky. There are many ways to accomplish this bone-warming task. You could simmer loads of rich meats and grains into something stewlike and hearty. You could make a silky, sophisticated puréed soup, one leaning heavily on homemade chicken stock and plenty of cream to give it a satisfying richness. Or you could worship what few local vegetables we’ve got this time of year and build your soup, letting the roots, shoots and alliums take command of the pot. These three soups do just that. Instead of depending on meat or quarts of homemade stock for depth, they use a few simple techniques to build flavor in the pot. You’ll taste the pure essence of vegetables, coaxed to their maximum potential. The first is to caramelize the vegetables, either in your soup pot or in the oven, to sweeten them and condense their juices. Next, add plenty of aromatics to the pot — herbs, spices, garlic, onions and the like — and let everything simmer for a long time to blend the flavors. These two steps alone eliminate the need for using stock. The vegetables melt down to create an intense broth. And don’t skimp on the salt. You’ll need a good amount here. This said, if you wanted to deepen the broth even more and have some good stock on hand, feel free to substitute it for water. Just take care to avoid nasty brands of canned and boxed stock, which will do more harm than good. And finally, when your soup is done, finish each bowl with a garnish that contrasts in taste, color, texture or all of the above. This final touch adds a lot. A squeeze of citrus, a dollop of yogurt or a drizzle of cream, a dusting of cheese or a good chile powder, a sprinkling of some herbs or croutons — all can take a perfectly fine soup into the realm of the delectable. Even a spiral of good olive oil to finish and some coarse sea salt can do wonders. Consider these three soups as starting points. You can play fast and loose with them, substituting what you’ve got for what’s called for, as long as you keep the basic vegetable families the same. Use roots for roots, leafy greens for leafy greens, and other alliums for leeks, onions and garlic. One exception is that you can go even wilder when replacing the mushrooms in the spiced mushroom and spinach soup. Pretty much any other flavorful vegetables will work. Try carrots, beets, broccoli or squash, adding a few minutes onto the cooking if needed for the vegetables to cook through. The combination of spices — a fragrant mix of cumin, coriander, cinnamon and allspice — will go nicely with any vegetable with a strong enough personality to stand up to them. Sweet potatoes, yes. Russets, maybe not. Kohlrabi may not be the most popular of winter vegetables, but that’s because it can be hard to find unless you get too much of it crammed into your community-supported agriculture box, as I do. And I’ve learned to love the turnip-like vegetable for its mild sweetness and crisp, juicy flesh. When broiled, kohlrabi browns at the edges, getting even sweeter. And it works wonderfully well puréed into a smooth, cozy soup. If you can’t find it, try regular turnips, radishes or rutabaga. Lastly, for my version of a chunky leek and potato soup, a base of browned leeks adds both sweetness and depth. 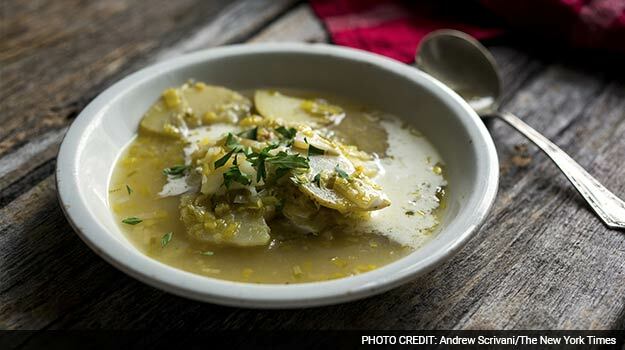 This recipe uses twice as many leeks as potatoes, which gives it a pronounced onion flavor, and also makes it a bit lighter than most versions. All of these soups will freeze well, so you won’t have to. 2. Meanwhile, heat the remaining 2 tablespoons oil in a medium pot over medium-high heat. Add the onion and cook, stirring frequently, until soft, about 7 minutes. Stir in garlic and let cook for 1 minute. 3. Add roasted kohlrabi, stock, 3 cups water, the bay leaf and 1 teaspoon salt. Bring mixture to a boil; reduce heat to medium, cover partly, and simmer until tender, about 30 minutes. 4. Discard bay leaf. Using an immersion blender or working in batches in a food processor, purée soup until very smooth. 5. Zest the lemon into the pot, then halve it and squeeze in its juice. Taste soup and add more salt if needed. Ladle soup into bowls and top with a drizzle of oil, grated cheese and a pinch of chile powder. 1. Halve the leeks lengthwise and rinse away any grit. Thinly slice the leeks crosswise. In a small square of cheesecloth, tie together bay leaves, thyme, sage, parsley and celery leaves if using. 2. Melt the butter or heat the oil in the bottom of a large pot over medium-high heat. Stir in the leeks and cook, stirring frequently, until leeks are soft and dark golden brown, 10 to 15 minutes. Stir in the garlic for the last 3 minutes of cooking. 3. Stir in stock or water, the sachet of herbs, the salt and pepper. Bring to a boil over high heat, then reduce immediately to medium-low; simmer for 5 minutes. 1. Heat 3 tablespoons butter or oil in a large pot over medium-high heat. Add half the mushrooms and half the shallots; cook, stirring occasionally, until most of the liquid has evaporated and the mushrooms are well browned, 10 to 12 minutes. Transfer mushrooms to a bowl and repeat with remaining butter, mushrooms and shallots. 2. Return all mushrooms to the pot and stir in tomato paste, thyme, cumin, coriander, cinnamon and allspice; cook until fragrant, about 1 minute. 3. Stir in 5 cups water, the salt and the black pepper. Bring mixture to a simmer over medium heat and cook gently for 20 minutes. Stir in baby spinach and let cook until just wilted, 1 to 2 minutes. 4. Using an immersion blender or food processor, coarsely purée soup. Mix in lime juice. Thin with water, as needed. Taste and adjust seasoning, if necessary. Serve with dollops of yogurt if you’d like.